Georgia allows students to earn dual credit in academic and/or CTE dual-enrollment courses through the Accel program, HOPE Grant program, Move on When Ready program, and joint enrollment. Depending on the program, courses are offered at the high school, institution of higher education, and/or online. Students may take developmental/remedial coursework for dual credit. Public postsecondary institutions are required to accept these credits (Education Commission of the States, 2015). The Board of Regents of the University System of Georgia and Gateway to College National Network have partnered with institutions of higher education in Georgia to provide a total of 13 Early College High School programs as part of the Early College High School Initiative (ECHSI). More information about schools participating in ECHSI is available at the ECHSI website (Jobs for the Future, n.d.). Georgia Department of Education. (2005). Georgia state plan: FY2009–2013 (July 1, 2008–June 30, 2013). Georgia has adopted the National Career Clusters Model and is implementing all 16 Career Clusters, with an additional Energy career cluster based on state workforce and industry needs (NASDCTEc, n.d.). For more information about programs of study in Georgia, visit the Georgia Department of Education website. 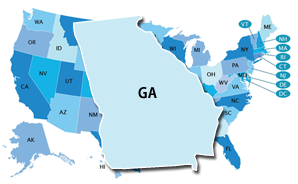 In 2009, Georgia mandated that all students in Grades 9–12 use the Peach State Pathways: Education and Career Planning Tool (U.S. Department of Labor, 2013). Georgia may have a state-specific Early Warning System, but the system is not publicly available.